I prefer a real one because of the smell; but rarely get one as I have a very realistic large synthetic tree. I put my tree very early also, and I don’t think a real one would last. 2. You’re in a coffee shop, it’s December, what do you pick? Hot Chocolate, with more whipped cream than liquid. 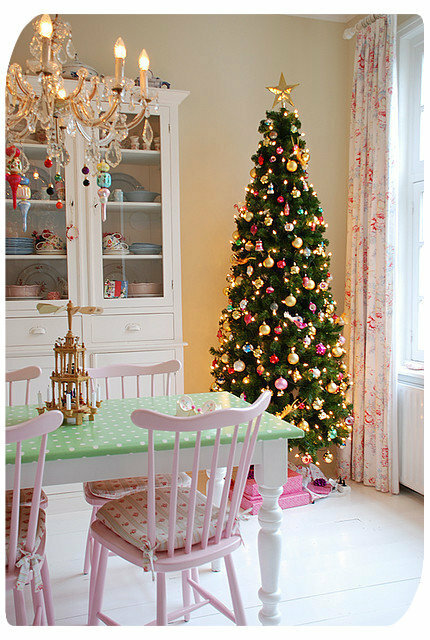 A very traditional mish-mash of colours and decorations. All my favourite ornaments are very different from each other. Anyone who says ‘giving’ is a big Christmas liar. Receiving is best by far. Who doesn’t love presents?! Eugh! No. Anything chocolate will do me just fine. 6. What’s your traditional Sunday lunch? HAS to be turkey. Husband challenged me on that once at the beginning of our marriage. He hasn’t tried again. Huge mounds of sage and chestnut stuffing, little sausages, lots of gravy, Wholefoods bread sauce, roast potatoes, buttery carrots. Usually some sort of seafood for starter, and a raspberry dessert of some sort. Pyjamas and no make-up all the way. Christmas is very private for me, so why not be comfortable. 8. What’s your favourite Christmas song? 9. What’s your favourite Christmas film? Christmas With The Kranks… America does christmas soooo much better than us. Before i.e. as early as possible without getting shouted at for waking people up at an upsurd time to watch.